Unlike other systems I have determined several different entries during a trend. You can use the method on anything from the 1 Minute time frame to the Monthly time frame. Being able to use the system on the smallest time frames is great news for many traders who have full time jobs. A system that triggers several trades in a short amount of time gets you in and out quickly. The highly accurate trend following aspects of the system insure you have many more winners than losers. It doesn’t matter if you have never traded a day in your life or you are a seasoned pro, this system is the fastest way to making money trading Forex you have ever seen. You will have delivered to your door the most comprehensive system for creating income in the shortest amount of time possible that exists today. If you are brand new to Forex or someone who needs a refresher course on the basics, this first video is for you. It is a full blow beginner course in Forex trading that leaves no stone unturned and no question unanswered. For some of you this may be your first journey into the exciting and lucrative world of trading Forex. You are about to learn how to not only control your financial destiny with certainty and resolve but to also work when you want and from wherever you want. I remember when I first started; it all seemed so foreign (pardon the pun). All these strange new terms. I had no idea what the foreign exchange market even was let alone what any of this meant. That’s why DVD 1 is an easy to understand Forex 101 course all on its own. It really is the best beginner course on the market and I probably could have packaged it and sold it on its own. I wanted to include it instead so that anyone new to trading or anyone just wanting a refresher course could have a simple way of learning everything you need to know about Forex. You will soon know what all of the terms below mean and it will become crystal clear what role each plays in trading. You will also discover different ways to get in and out of the market and some simple and effective ways of analyzing price behavior that can help you make sound decisions when you trade. 1. Introduction To Forex – Here you get an overview of just what the Forex market is and how it works. For those who are just beginning I made sure I started at the beginning. So many courses assume you know things that unless you have traded, you probably don’t. You will after this DVD. 2. Currency Pairs – I explain all the currency pairs you need to know to make money in the market. I don’t waste time on every currency in the world, just the 8 pairs that can be traded for the biggest and most consistent profits using my system. 3. PIP – Here you learn just what a PIP is and how a currency price is broken down into its smallest denominations. I’ll explain that not all currencies have “cents” and what that means to trading in a way that will make “sense” even to the complete beginner. You may not understand what a PIP is right now, but trust me, you will not only know what a PIP is but how to have them rolling in like crazy which is exactly what you want. 4. Forex Terms – Here I talk about some basic terms as they apply to trading and how you are trading. You will learn about the different ways to trade the Forex market and the advantages of some types of trading over others as it applies to doing what you are buying this to do. Make money fast. This video is short and simple but important to understand. 5. Role Of A Broker – Here you’ll learn what is a broker is, why you need one, and the different types of brokers that are available to you. It is important that you fully understand the role of your broker, what you should expect from your broker and how to choose the right one. I guide you through every step of the process. 6. Spread – The spread is how the brokers make their money. You’ll learn the three different types of spreads and what each can mean to your profits. 7. Lot Size, Margin & Leverage – This is the real beauty of Forex, the use of leverage. That means for example that you can control and trade $1000 with as little as $20 of your own money. I know that sounds too good to be true but I will teach you how all this works in this video. 8. Swap – How you can actually get paid just for holding a position. Or get money deducted for holding a position. It’s therefore a good idea to understand how this works and after this video, you will. 9. Kinds Of Orders – We will look at the different kinds of entry orders, the different kinds of exit orders and at the end so you how they all work in actual trades. There are several ways to get in and out of the market and I will teach you how to do both in a way that puts cash in your pocket. 10. Charts – First we will look at the three different kinds of charts the MetaTrader4 platform offers then will look at the anatomy of a Japanese candlestick breaking it down to its different components. You will learn an easy, efficient and fast way to know what the market is likely to do. 11. Timeframes – Here you will learn all about the different time frames and more importantly how you can know the overall market direction by using more than one time frame. Something other systems just don’t do. 12. Trading Sessions – One of the great things about Forex is that the markets are open 24 hours a day, so if you have a full time job you can still earn a nice extra income in as little as a few minutes per day. Certain hours do work best however and you will learn all about the major trading sessions, and discover the one where all the real money is made. 13. Peaks, Valleys & Trends – I will show you how the market moves and how that zig zag movement can be translated into a trend. The trend is the direction of the market that will present us with the best trading opportunities and with my system, the biggest profits. 14. Support & Resistance – You will learn what support and resistance is, when support becomes resistance and vice versa. We’ll look at the break of support and resistance and summarize it in a way where it all makes sense. Support and resistance are often obeyed by the market more than once and that’s what makes it so powerful. 15. Chart Patterns – Understanding these is crucial to trading profitably. Here you will learn the basics that later, when you are using this system, will have you reading the direction of the market in a way that will make others think you have a crystal ball. 16. Candlestick Formations – Understanding these can help you get out of a trade before it reverses against you or help you from getting into what could potentially be a bad trade. You will learn all of them that are used by most all traders and because of that, carry the most weight in the market. As you can see, this system will work for you even if you did not know what Forex was before today. The best part is that I have made it so simple to understand and easy to learn that you will feel like an old pro in just a day or so. The MetaTrader4 (MT4) platform is one of the most commonly used types of trading software because of speed and ease of use. I use it throughout the course. For those unfamiliar with MT4 or who just need a refresher, this DVD will equip you with all the knowledge and skills that you will need to get you up and running in no time. Just pop this DVD into your computer to learn how to setup a practice account, use the different tools and how to place orders. You will also learn how to use the windows in your platform, make adjustments and navigate quickly as you trade. 1. Getting Started – How to download and install the MetaTrader4 platform. How to delete all the default stuff you won’t be using and set up your charts the right way. 2. Chart Properties & Tools – Here’s where we dive deep into charts and make you an expert on setting yours up. By the end of this video it will all seem like child’s play. 3. Indicators – Your indicator is your treasure map. The one that you will get with this system is the most highly advanced, easy to use money magnet ever created. Here you will learn everything you will ever need to know about indicators, adding, modifying, removing, importing, adding one over another, using the MetaEditor, you name it. 4. Templates – Once you have made the changes to a chart that you like, you’ve got the indicators, the background, the candle colors and so on, you can save that as a template and add that to new charts. There’s no need to go through the whole process each time you create a new chart. As with all the tech stuff I make setting this up so easy a technoidiot could do it. 5. Chart Lines – Here I show you how to set up the lines on your chart. Once again, it’s done in a very easy to understand step by step manner. 6. Placing Orders – There are seven main things every trader must know about placing orders. I go into detail, once again step by step, so that you know exactly how to do this the correct way. 7. MT4 Windows – Next we look at the various MT4 Windows. The Market Watch, The Data Window, The Navigator Window, The Terminal Window and the Toolbar. I show you how each works and explain their function. 8. Chart Adjustments – Making adjustments to your chart will be a snap after you watch this short video. 9. Opening A New Account – Just what it says, I walk you through how to open a new account as well as how to get a new data feed in MT4. 10. Adding Text & Labels – This sounds pretty self-explanatory however you will learn some things here many experienced traders don’t know. 11. Profiles – A profile is simply a series of charts. You have a series you want to save, you can easily save them as a profile. This can be very useful, however it is critical that you know how to do it right. Doing it wrong can spell disaster. 12. Fast Navigation – Everything about the Rapid Results Method is about quickly and efficiently trading profitably. This will show you how changing the currency pair, changing the time frame, or going to a very specific date can be done with the push of a button. Learn how to use navigator favorites to save even more time. This DVD will explain the different components that make the Rapid Results Method execute fast and profitable trades. Here, I explain the different indicators used in the system and show how they are used. I will also show you the different phases of the market where you can find the best trade setups. You will also discover different ways to trade the system, the buy and sell trade rules, and some simple tips that will keep you away from bad trades. Introduction To Rapid Results Method – In this intro I explain just what the Rapid Results Method is and what makes this, in my opinion, the fastest way to make money in Forex ever developed. There are many components to this system that are 100% unique to this system. I developed them and you won’t find them in any other system anywhere at any price. The ability to trade profitably on any time frame from the 1 minute all the way up to the one month. By having a system that can produce amazing results on the smallest time frames you have the ability to make money fast while spending very little time in front of your computer. Life is busy and that’s why I created this system. A system where should you miss an opportunity another will happen very quickly… on the same trend. In order to get rapid results we want a system that will have the greatest odds of success with many trading opportunities and that’s what this does. It is a very comprehensive, very efficient, very high win ratio trading system. The Rapid Results Method is adept at taking money from the Forex Market that I have invented more than one way to do it. I wasn’t happy with just a winning system; I wanted every last PIP I could get when I sat down to trade. There are actually a few different types of trade you can take with the Rapid results Method. That’s what makes it so adaptable. I this video I’m going to show the right trade for the each situation. For the first time many people will understand at this point why having one way to trade Forex doesn’t work. You need to apply the right tool for the right job and you will learn just how I do that in this step-by-step video. Market Phases – Here we look at the different market phases. The arrangement of the different moving averages. When the different moving averages are in different orders, the market is in different phases. The market will behave in a certain way according to the certain phases. We will look at the ones that are most important and that we can take the most advantage of to nail trade after trade. Dynamic Positioning Indicator – This is an indicator you have never seen before. It does not exist outside of the Rapid Results Method and it’s the 700 horsepower engine behind the breath taking speed of making money with this Forex Ferrari. It is dead on accurate and can weigh many pieces of information at once to read the direction of the market like a state of the art GPS reads the road. Entering A Buy Trade – I can’t really say much here without letting out some high level secrets reserved for only the few that join me in the Rapid Results Method. I will say that you are going to learn exactly how to enter a buy trade following the rules of the system and how it flat out wins. This makes growing your account just look easy. Entering A Sell Trade – See above, same here folks. Stop Loss – By learning exactly how to set a number of different stop losses using my system you will learn how to greatly reduce risk and well… stop losing. “It’s not just about winning, it’s also about not losing bucko.” Can’t remember who said that but it’s damn accurate in my opinion. Take Profit – How to set your take profit. We look at risk to reward as well as other factors and I share some secrets that will have you doing just what the name of this video implies… taking profit. Exiting A Trade Early – “You got to know when to hold them and know when to fold them” – Kenny Rogers. There are a few reasons you may want to get out of a trade even before your stop loss gets hit. I reveal these reasons and explain precisely what to do to keep you in the money. 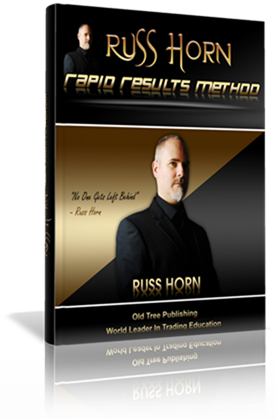 In this DVD, I go into deep detail on how to trade the Rapid Results Method. I begin by showing you how to setup your charts to trade the method. Next, I show you how the market phases look on real live charts. I then discuss the three basic ways to trade the system: Ribbon, Ghost and Shark. This is one of the real key strengths of the system. Ribbon means short term signals, Ghost means medium term and Shark means long term, so you can trade a variety of setups depending on what the market presents. All on the same chart. You can look at one timeframe and see those types of trends (short, medium, long) so you no longer need to keep shifting from one timeframe to another. To give you a better understanding of how to profit from these setups, I show you step-by-step examples of buy and sell trades on real charts. Now on each of these subjects I go into minute detail of how to apply everything and be raking in the pips at a rapid fire pace. I really can’t go into too much detail here, these powerful methods are reserved for the handful of people who want to sit down for a few minutes or a few hours each day and make as much money trading as they want. 1. Chart Setup – I don’t believe in black box systems where you get handed something and just have to trust that it will do what it says it will do. Though it’s done for you with my system in this video I walk you through how to set up a chart including the DPI and all the components of the system. By the end you will know exactly what makes this tick and how to set it up from scratch. 2. Market Phases – Though we covered market phases in a previous video we go even deeper into it in this video. There are phases we want to trade and phases we don’t want to trade. Taking a trade in the un-ordered phase can be bad news. We want to limit our trades to the trending phase. In this video I will teach you the three phases you need to pay close attention to and how to spot them. Especially how to spot the perfect trending phase. This is important if you want to see a majority of winning trades and money pouring into your account like I do. 3. Ribbon Trade – In this video I show you how the Ribbon Trade actually works. It is the way the Rapid Results Method identifies a trend in conjunction with the others very specific parts of the system that makes this system the instant money machine it is, but it’s important you understand how each works individually. 4. Ribbon Buy Example Trades – Nothing helps you learn faster and easier than actually seeing something done. Here I show you an example of a buy trade using the Ribbon. 5. Ribbon Sell Example Trades – Here the example is a sell trade using the Ribbon. 6. Ghost Trade – The next is the Ghost Trend. Once again I want you to learn this magical combination of the components of the system and how they work as a whole within the system that is so powerful. 9. Shark Trade – The Shark trade or more specifically the Shark environment is the final combination of the top secret Rapid Results Method. When used as part of the system, as a whole, takes profit out of the market faster than a shark at feeding time. By now it should all be coming together and you will be seeing just how unique and powerful this system is for quickly getting in and out of the market with a big ol’ pile of money to show for the short time you spent in front of your computer. Nothing teaches you the system faster, and lets you see the raw power of the system better than seeing it in action on live trades. In this DVD, I show you trade example after trade example so that by the end you have a clear concise understanding of how to trade the system. These trades are all live trades by the way, not some cherry picked trades you see in most courses. 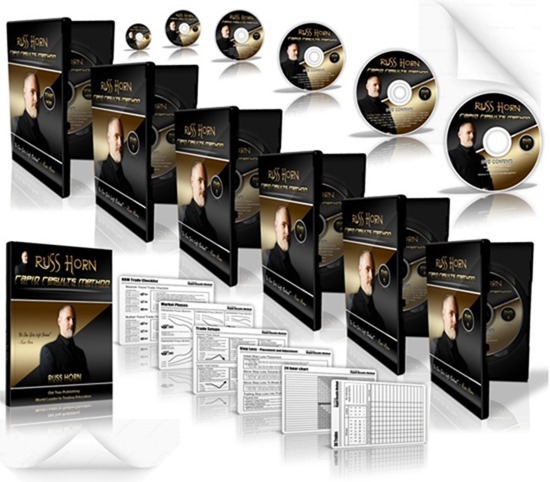 In this DVD, I will show you the real power of the Rapid Results Method. Trade after trade using the system in live market conditions. Watching me enter and exit trades as the signals occur on the charts, actually seeing the system in use, is the best way to fully learn and understand the system.